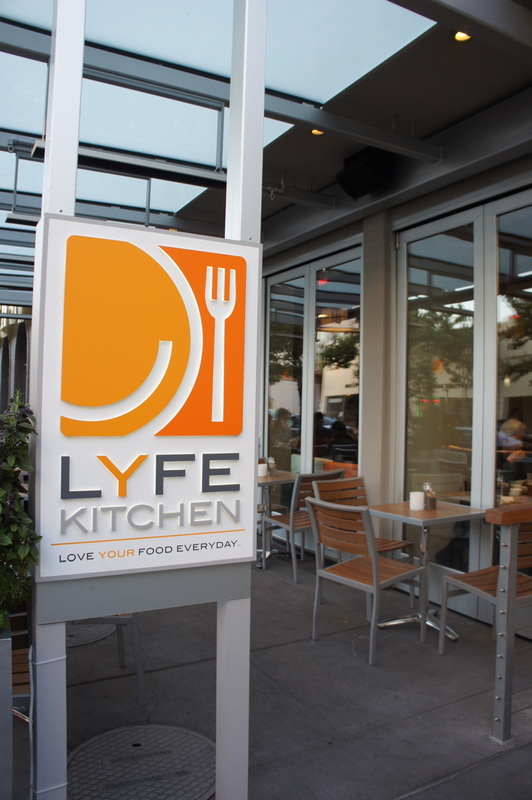 LYFE (Love Your Food Everyday) Kitchen is a new restaurant in Palo Alto, CA and the first of what an ambitious, Chicago-based group hopes are many restaurants across the country as well as a line of prepared soups and meals being sold at Costco. The executive chefs are Art Smith and Tal Ronnen, who used to cook for Oprah Winfrey. They serve, breakfast, lunch, and dinner 7 days a week. There are starters, soups, sides, sandwiches, flatbreads, salads, and main courses on the dinner and lunch menu. Many have gluten-free or vegan options. The peas and carrots risotto was really delicious – fresh, rich, and packed with vegetables and flavor with a reasonable serving size that ended up being quite filling. The risotto is actually made from farro and steel cut oats which was really unique and quite good. The napa cabbage salad featured broccolini, red cabbage, edamame, cranberries, cashes and sesame dressing and was crunchy and had lots of texture and flavor. There were so many delicious-sounding salads on the menu, and one suggestion would be to offer a combination salad plate where one could pick any three. There is meat on the menu, including hamburgers, unfried chicken, and some seafood dishes. The grilled mahi fish tacos were fresh, but pretty standard. There were a couple of “coolers” on the menu: a pomegranate-cranberry, and pinapple-coconut lime, both of which were really refreshing, especially the pomegranate-cranberry. Smoothies, juices, beer on tap, and wine are also available. The best dessert was the lemon poundcake with Greek yogurt and fresh strawberries – very lemony and not too rich. The volcano chocolate cake was moist with lots of chocolate. The restaurant has a warm, modern design featuring an indoor herb garden. There is outdoor seating and plenty of tables inside, and it was pretty packed on a Thursday night. Calories and sodium content are posted prominently on the menus, and everything comes in under 600 calories. This is not a full service restaurant. Orders are taken and paid for at the register in front, and then a runner brings food out to the table. Water and utensils are self-serve. They could have done a better job clearing dishes from the table. Disclaimer: the vice president of marketing saw me taking pictures for this blog and stopped by our table. He explained that their philosophy was that it all starts with taste. He also told us that Tim Cook, CEO of Apple, dines there weekly at the booth where we were sitting. He sent us some complimentary corn chowder as well as three dessert to try. The corn chowder was really good and was made with cashew cream instead of heavy cream, which really worked. I did not miss the heavy cream. Among the additional desserts that were sent, I think the carrot cake was off the menu. It had good carrot flavor but was a little bit dry. A coconut ice cream or cream cheese frosting would have gone well with the carrot cake. The banana-rum cheesecake (non-dairy) had a strange texture and flavor, with a little too much rum. The vegan chocolate chip cookie was good for a vegan cookie, but lacked the richness of a real chocolate chip cookie made with butter. Overall, I really liked LYFE Kitchen and how they successfully delivered the concept of flavorful, fresh, fast food in an inviting setting. Definitely recommended. Mission Bowling Club is a new bowling alley/bar/restaurant on 17th and S. Van Ness in the Mission District, San Francisco. The food is from Chef Anthony Myint of Mission Street Food fame. MBC is open every day from 3pm until 11pm or 12am, opening at 11am on weekends for brunch. I went for brunch and sampled the fried chicken and waffles. The fried chicken was excellent – crisp, flavorful, juicy with a good amount of heat. The waffle served with maple butter was not as memorable. The homemade biscuits and sausage gravy were served with home fries and were very good. 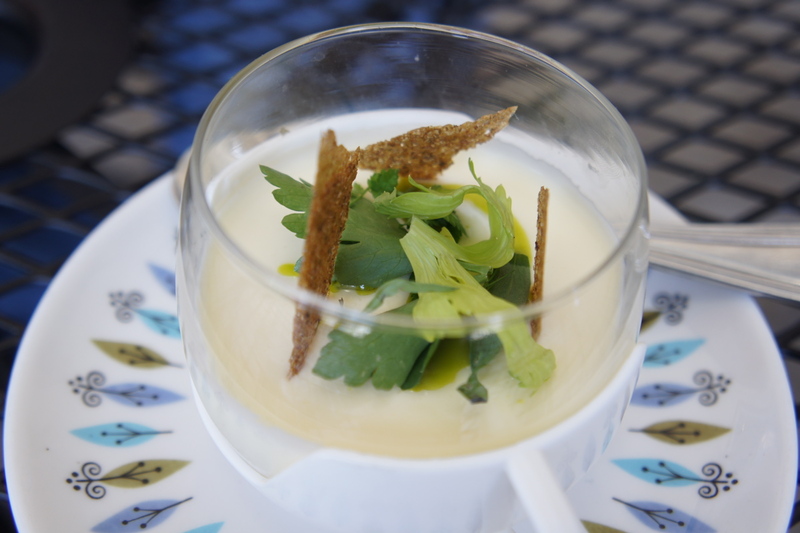 My favorite dish was the Buttermilk Panna Cotta, Chamomile Crisp, and Spring Herbs, which was a pretty sophisticated dessert and really delicious. I will have to go back after 3pm when they serve their regular menu that includes the Mission Burger, a $15 1/2 lb aged and granulated patty which Chef Myint used to serve out of the meat counter of a Vietnamese grocery a couple of years ago. The menu also includes a sausage corn dog and more complicated plates like a blackened salmon with potato latke, creme fraiche, salmon roe, cucumber, and horseradish. There is a nice outdoor seating area, bar area, and of course bowling lanes, all of which are nicely designed. A fun place to eat and play in the Mission. Link to Mission Bowling Club website here. 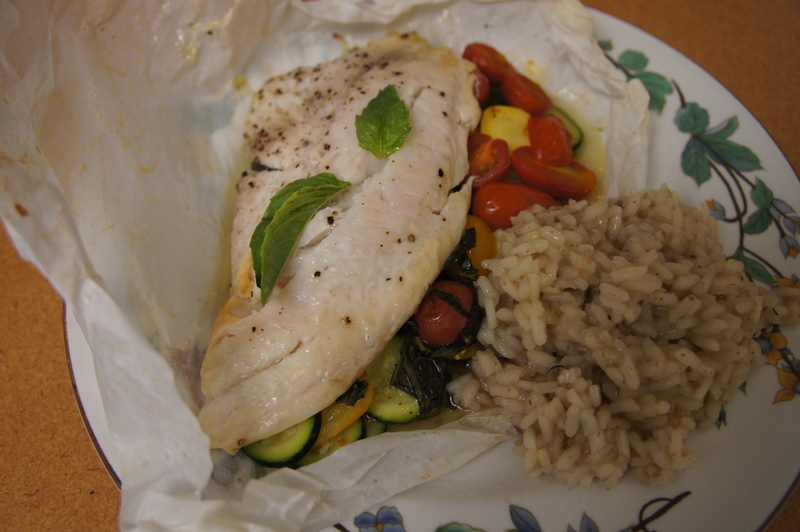 Cooking in parchment paper helps to seal in steam and moisture and concentrate flavor. There are several recipes from the June 2012 Bon Appetit magazine that highlight this technique. In this fish recipe, fish fillet like cod or halibut (I used tilapia) is layered on top of a bed of shallots, tomatoes, summer squash, and basil. A little bit of white wine and olive oil combine with the fish and vegetables to make a nice, light sauce. Baking time in a 400 F oven is 10-15 minutes. 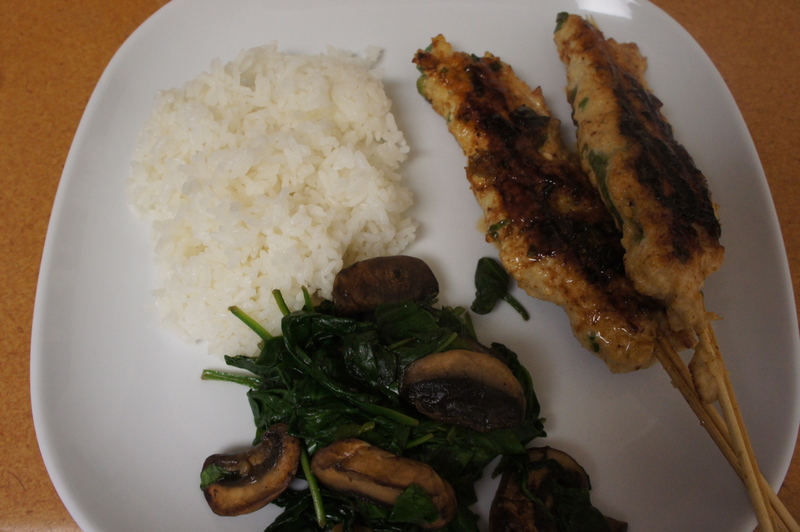 This dish was mildly flavored, but healthy and easy to do on a weeknight. State Bird Provisions is a new restaurant in San Francisco with a really unique concept where creative small plates are served dim sum style from a cart or on trays carried around by the waitstaff. When the server comes around with the seafood cart, it it extremely tempting to pick four or five different plates, because everything looks so good, and the taste does not disappoint. Most of the plates are enough for two people to have a few generous bites and are priced from $5-9. The passed plates change every night and even change during the course of the evening, with approximately 10-12 being served on a given night. 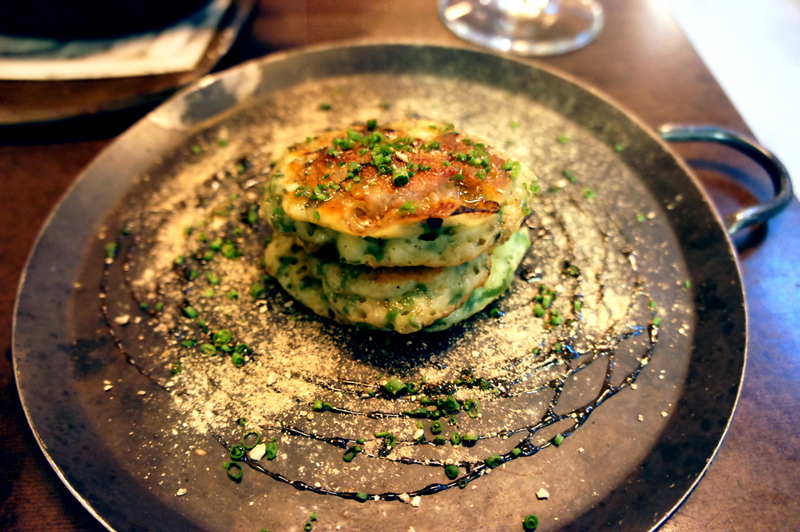 There are French, Korean, and Eastern European influences, which might seem quite disparate but none of the dishes seem out of place and instead provide a nice variety of choices. Highlights included duck liver mousse with sweet almond cakes smoked duck breast with potatoes and pickled onions, clams with pork belly and kimchi stew, a broccoli and rye-stuffed pierogi with pickled bull’s blood micro greens and sour cream, whipped avocado with scallops and mussels, and yellowtail tartare with quinoa. In addition there is a menu with “commandables” that can be ordered, including the fried quail with “provisions” – lemony onions and parmesan, a very fresh red trout with crispy rice battered skin, topped with mandarin oranges, macadamia nuts, and brown butter, and interesting savory pancakes, such as one served with guanciale, ramps, and candy cap powder. The desserts were excellent. A shot of peanut-infused milk with muscovado syrup was delicious. A chocolate ice cream sandwich with hints of cardamom and cherries. Strawberry granita served on top of tapioca with macerated strawberries and almonds. State Bird Provisions was opened by a husband and wife team earlier this year on Fillmore Street in San Francisco, CA. The quirky name references the state bird of California, the quail. The storefront is dominated by an open kitchen. There is a counter at the kitchen where one can stand and dine, picking plates as they are prepared in the kitchen, while tables are in the back. Service was efficient but sometimes a bit terse. I think they are pretty busy. Overall, however, I really liked this place. The concept is truly original making for a fun experience with really inventive and delicious food. Highly recommended. Link to restaurant website here. Update August 2012: Bon Appetit magazine just named State Bird best new restaurant in America in 2012! And they published several recipes, including the delicious Rice Seared Trout with Hazelnut Brown Butter and Peanut Muscavado Milk. Link to article and recipes here. This recipe for Soba Noodle Soup by Mark Bittman appeared recently in the New York Times. Soba noodles are a Japanese noodle made from buckwheat flour that cooks quickly and yields a uniquely flavorful noodle. The broth is quite easy to make with a few specialty ingredients: bonito flakes, mirin, and soy sauce, all of which can be found in a Japanese grocery store. I cannot comment on the authenticity of this recipe, but the flavors are a light, well balanced mix of savory, briny, and sweet. 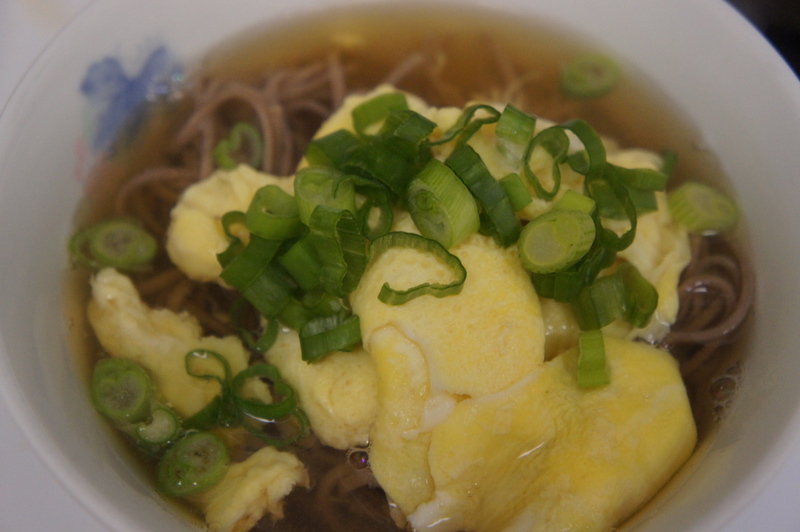 A beaten egg is cooked in the broth and becomes light and fluffy and absorbs the broth flavor. The scallions are essential for flavor and texture contrast. Japanese yakatori shops are famed for their grilled meats served on skewers. Bon Appetit May 2012 recently ran a feature on preparing tsukune, or chicken meatballs, at home. Ground chicken, miso paste, sesame oil, and scallions are the simple mixture that is loaded onto bamboo skewers. Tare is a basting sauce made with soy sauce, sugar, and in this case, chicken broth. The chicken broth replaces the roast chicken drippings that are usually used to prepare tare, as in David Chang’s Momofuku tare recipe. While it obviously does not provide the same depth of flavor, the chicken broth is a convenient substitute. After initially grilling the meats, the basting sauce is then applied and caramelizes nicely on the barbecued meat.